Editor’s Note: this is the second installment in a series of articles dedicated to the 95% of people in the U.S. who have never invested in a startup, a venture capital fund, a private equity fund, or a hedge fund even though they are permitted to do so and even though doing so may make sense to achieve property diversification. Read Installment #1 here. Bob lives in Middle America, where he owns a nice house in a middle-class neighborhood and drives a practical car, which he bought, used, several years ago. Bob isn’t fancy, however. In fact, if you asked him, Bob would tell you that he was just an ordinary guy. Meet Michele. Michele lives in a large coastal city. She owns a nice, but not over-the-top condo in a residential neighborhood and walks or relies on public transportation to get to work. Michele isn’t fancy either; she’s just an ordinary urbanite. Finally, meet David and Isabella. They live, with their two school-age children, just outside of a mid-sized city. They also own a nice house in a nice suburban neighborhood and each drives a nice, but not new, car. But like Bob and Michele, David and Isabella aren’t fancy and if you asked them they would also tell you that they’re just an ordinary family. Aside from being ordinary, there is one other thing that Bob, Michele and David and Isabella all have in common: they’re all accredited investors. Bob is self-employed. He owns a factory that employs about 50 people. It’s located in the same town that he lives and grew up in. Bob’s net worth (not including the positive equity in his primary residence) is about $9 million, making him an accredited investor under the net worth standard. Michele is a doctor. She works in a busy emergency room located on the opposite coast from where she grew up and went to medical school. With several years of experience under her belt, Michele’s salary is comfortably in excess of $200,000 a year, making her an accredited investor under the individual income standard. David is a Senior IT Specialist at a Fortune 500 company and his wife, Isabella, is a Marketing Director at a mid-sized private company. They met in college, married, and not too long thereafter started a family. Over the last several years, their combined salaries and year-end bonuses have exceeded $300,000 a year, making them accredited investors under the joint income standard. Bob, Michele and David and Isabella are all accredited investors, yet none of them has ever participated in an alternative investment opportunity requiring that they be an accredited investor. Most of their investment funds are held in IRAs, 401ks or 403bs, in publicly traded mutual funds, individual stocks, and bonds, and, in Bob’s case, in his own business and some local real estate. Editor’s note: To learn more about the alternative investment opportunities available, please see Options for the Accredited Investor. 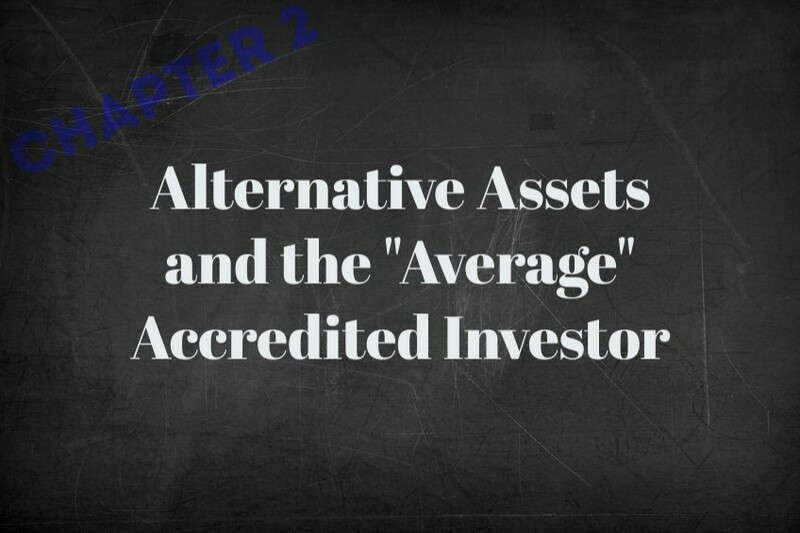 2.3 Why haven’t these accredited investors made investments in alternative assets before? Let’s take a closer look at Bob. Bob doesn’t live in Greenwich, Connecticut, Silicon Valley, or any of the other affluent suburbs of major metropolitan cities where he’s likely to have investment bankers, tech entrepreneurs, or fund managers as friends and neighbors. Nor does Bob have a finance degree or an MBA. He is completely uninitiated when it comes to the world of alternative investment opportunities and accredited investing. Michele and David and Isabella are in similar boats. What’s more, until 2012 the federal securities laws prohibited accredited investment opportunities from coming to them unless they came through someone with whom Bob, Michele or David and Isabella already had a “pre-existing substantive relationship”. In other words, the law prohibited anyone from conducting a “general solicitation” or any sort of public advertising to attract accredited investors. As a result, without knowing the right kind of people, Bob and people like him have historically been out of luck in terms of being exposed to alternative investment opportunities. In other words, the law prohibited anyone from conducting a “general solicitation” or any sort of public advertising to attract accredited investors. However, primarily as a result of the JOBS Act, everything has changed. While there are many important features of the JOBS Act, its lifting of the prohibition on general solicitation and advertising is the key-most feature for people like Bob, Michele, and David and Isabella because makes it possible for each of them to become acquainted with the fact that he or she is an accredited investor and what that means. If Bob, Michele, David, or Isabella remind you of you then this book is for you. Now that the necessary JOBS Act regulations are in place, accredited investors like Bob, Michele and David and Isabella are being bombarded by traditional and new media with information about alternative investment opportunities that are only available to accredited investors. They may even have had broker-dealers and other investment intermediaries, private equity funds, venture capital funds, entrepreneurs, and others, reach out directly, seeking to persuade them to allocate a portion of their investment portfolio to such alternative investment opportunities. Accredited investors who are not experienced in making such investments will suffer some degree of information overload, as they get up to speed on these investment categories. They also need to be wary of scams and schemes designed to take advantage of their lack of knowledge. At the same time, however, the opportunity to diversify into these alternative assets may make sense for you. If you are similarly situated to Bob, Michele, David, or Isabella, then you will want to understand this area—even if only to decide it is not for you. You will notice that throughout this series, I use the term “we.” This is done to acknowledge the great editorial assistance of the Financial Poise Editorial Team. This series is based on my book The Investor’s Guide to Alternative Assets: The JOBS Act, “Accredited” Investing, and You.